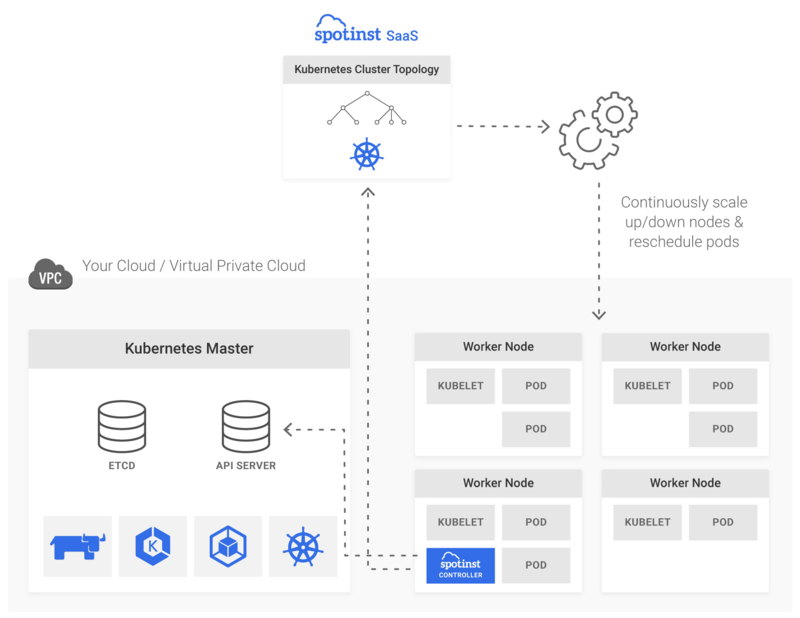 Spotinst Ocean is a managed infrastructure scaling service for Kubernetes that adjusts infrastructure capacity and size to meet the needs of Pods, Containers and applications running on the cluster. Ocean monitors for pending Pods and automatically adjusts the size of the cluster based on the Pods constraints and labels. Ocean ensures that the cluster nodes are utilized and scales down underutilized, expendable nodes to ensure maximal cost optimization. A Pod that lives within the k8s cluster, responsible for collecting metrics and events. The events are being pushed via one way secured link to the Spotinst Ocean Saas for business logic and capacity scale up/down activities. Ocean SaaS layer is responsible to aggregate the metrics from the SPT-CTL and build the cluster topology. Using the aggregated metrics, the SaaS component is applying other business logic algorithms such as Spot / Preemptible Instances availability, prediction, and Instance size/type recommendation to increase performance and optimize costs via workload density instance pricing models, across On-Demand / Reserved (RIs / CUD) and excess capacity nodes(Spot Instances / Preemptible VMs).